Singer Rihanna is gracing the cover of British Fabulous Magazine this month. She's working the cover.. smiling or speaking with her eyes as Tyra Banks would say. She looks great, Rihanna's definitely well acquainted with the camera. 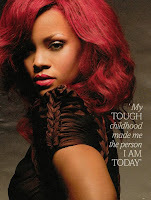 For more pics and her comments when asked about Breezy, why she dyed her hair, and more after the jump. "You obviously wanna talk about Chris Brown, I dont." Settles that right?!? lol Handled that properly. Lol she shut her down real quick.